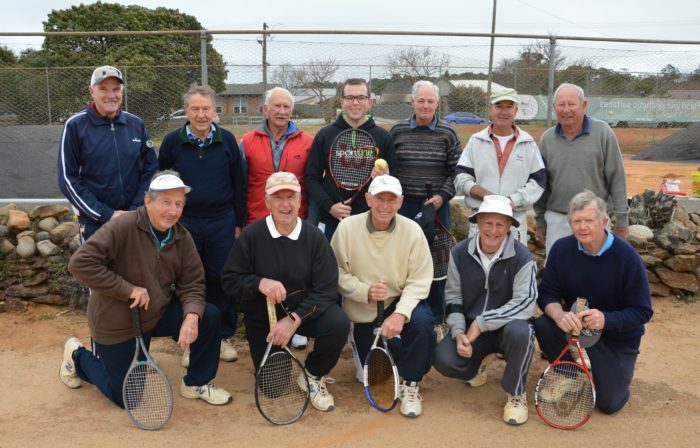 Northern Tablelands MP Adam Marshall pictured with members of the North Armidale Tennis Club this morning. Back row, left, Simon Johnson, Phil Abrahams, John Dugdale, Adam Marshall, Ron Shaw, Michael Duncan and Peter Glasson. Front row, Simon Fletcher, Owen Croft, Jack Abbott, Ian Duncan and Les Davis. THE installation of artificial turf on one of the courts at the North Armidale Tennis Club is well underway thanks to a $19,000 grant from the State Government’s Sport Facility Program, Member for Northern Tablelands Adam Marshall announced today. “I am delighted the club was successful in its application for funding to undertake a major upgrade one of its three historic gravel-based courts,” Mr Marshall said. “The members of the club were very keen to covert one of their courts to synthetic turf. “Not only does it give players the option of two playing surfaces but cuts down on the time they have to put into the maintenance of their courts and costs. North Armidale Tennis Club member Michael Duncan said the club was delighted they’d received the grant and pleased they were able to improve the playing conditions for their members. “We do all our own court maintenance so this will make life a little easier for us,” Mr Duncan said. After his hit this morning, Mr Marshall said he was looking forward to his next visit back to the club to play on the new court. “It’s great to see our local sports facilities being improved for future generations and I hope to see even more players on the courts next time I’m back,” he said.